Older patients at a Moray care home and hospital have been given the chance to dance with a new silent disco scheme being piloted in the region. 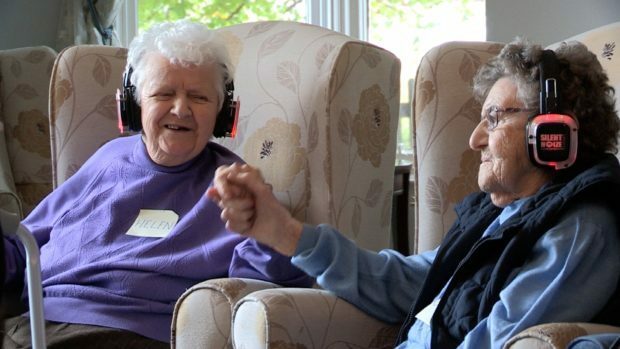 Pensioners at Dr Gray’s Hospital and Abbeyside Care Home in Elgin have been boogying to their own choice of music through specially designed headphones. It is part of a new project designed for dementia patients in Australia, with the silent discos revealing huge benefits amongst sufferers, including better focus, increased energy and improved mood. The first of its kind in the area, the scheme brings the popular activity, often seen at festivals and raves, to Moray pensioners and is a joint project between arts organisations in the region. Studies have shown that with the aid of music, dementia patients can recall memories and emotions and have enhanced mental performance. Dancing along to the songs can also be extremely beneficial to older people in improving their balance and preventing trips and falls. The project was led by artists Graeme Rodger and Mike Inglis as part of a Grampian Hospital Arts Trust project Resonate: Disseminate – a two-year initiative based at Inverurie Community Hospital and Dr Gray’s Hospital, that offers a programme of arts delivery in community healthcare facilities. Mr Rodger explained why he came up with the idea to introduce silent discos to older people. A son of one of the participants, known as Robert, praised the energetic activity for making his mother happy. It is hoped that this pilot will attract funding to offer it to more pensioner groups in Moray.